I am in the second of a three-part series on the people, companies and situations that accounting automation is best for. As I have written many times, automation is good for a lot of things, but in my experience there are certain people, types of companies and special situation that accounting automation can really help. Without sounding like a broken record (which, by the way I was trying to explain to my kids what a skip on a record sounded like,,, and they didn’t get it) people today need more than just cool features to justify automating accounting processes. Last Thursday I kicked this portion of the series off by writing about companies that have centralized accounting and dispersed operations, and on Friday I wrote about companies that have project based accounting. 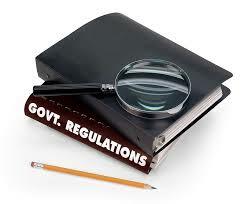 Today I am writing about those companies that have some type of regulatory requirements. Now, I want to go beyond just writing about financial or internal audits (even though they can greatly benefit from automation) and I want to focus in on those companies that are subject to mandated audits. They first type of company I want to write about are those companies that are subject to Sarbanes – Oxley rules. These companies are traded on one of the many stock exchanges and –thanks to Enron— the government has required them to have repeatable, uniformed,and reportable accounting processes. This requirement falls under the Sabines –Oxley laws, which were established in 2004. The law requires “C” level people in public companies to be aware of accounting and finance practices. The best way for “C” level people to be aware of accounting and finance practices is for those practices to be automated. Automation is a great way to stay in line with making sure you accounting processes are repeatable, uniformed,and reportable. Also note that all automation technically is repeatable, uniformed,and reportable processes. If you are an accountant or working for a company that is highly regulated, automation is a great way to speed up processes and cover your assets… so to speak… never underestimate the power of detailed reporting and tracking in a government office or publicly traded corporation. Tomorrow I am going to write about all other companies and accounting automation… stay tuned!